A screenshot of the new AR ad tool. 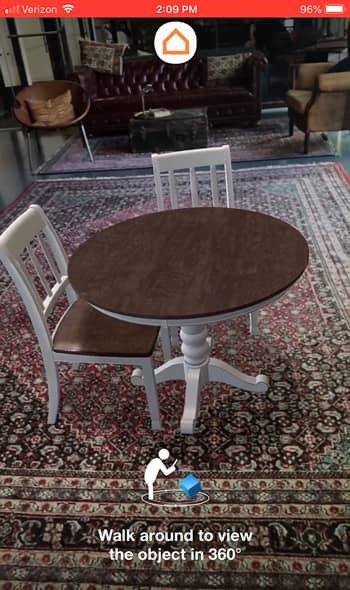 Ashley Furniture Industries, Inc. (Ashley) recently announced that it's e-retail company, Ashley Global Retail and media agency Merkle, partnered with Verizon Media on an augmented reality (AR) advertising campaign; bringing the experience of shopping-in store to mobile devices. “One of the key challenges when shopping for furniture both online and instore is visualizing the size/scale of each piece within the home. We see great potential for AR ads to both delight consumers and improve the overall shopping experience by virtually bringing our products into their homes prior to purchase,” said Nick Lezin, VP of Marketing, Ashley Global Retail. Earlier this year eMarketer found adults were spending an average of 3 hours, 35 minutes per day on mobile devices in 2018, also noting that by next year mobile may surpass TV as the channel attracting the most minutes. Meaning, brand marketers need to be on mobile. But it’s not about reaching a target audience on mobile; it’s about giving mobile consumers the utility they’ve come to expect, like augmented experiences that help them visualize products in their own home. A recent study found over one third (37%) of consumers are willing to pay more for a product or service, provided they can get a superior shopping experience on mobile. Today, 75 percent of consumers expect retailers to offer an AR experience of some kind. By the year 2022, the mixed reality (MR) and AR market in the U.S. is expected to reach 80 billion dollars. New immersive ad formats like AR give consumers the opportunity to truly experience a brand or product. Since the launch of Verizon Media’s 3D and AR ad products, brands ranging from automotive to retail have jumped onboard, to deliver high-quality interactive 3D experiences to their audiences. More about Ashley HomeStore: Ashley HomeStore is committed to being your trusted partner and style leader for the home. This commitment has made Ashley HomeStore the No. 1 furniture retailer in the U.S. and one of the world’s best-selling furniture store brands with more than 9000 locations in 54 countries. For more information, visit www.ashleyhomestore.com.